We could be losing another great science fiction bookstore soon. Citing an increase in the local minimum wage and pressures from Amazon.com, Borderlands Books announced a plan to close by the end of March. This would be a huge blow not just to San Francisco, but to science fiction authors who made this store a regular oasis on tour. 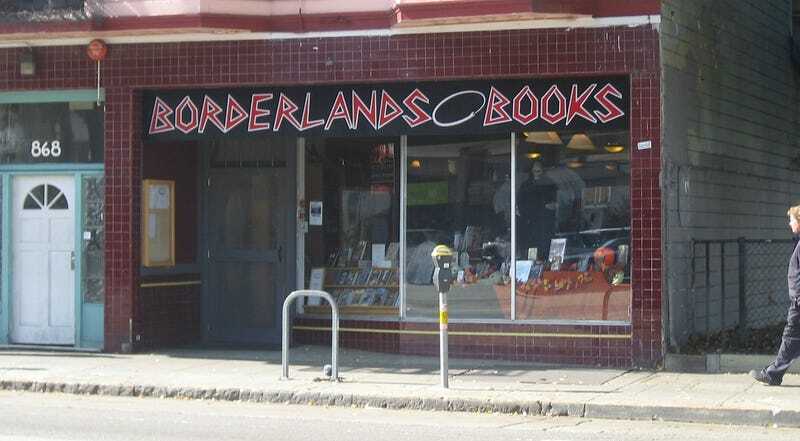 We paid homage to Borderlands back when io9 launched in January 2008, and we've held meet-ups in their cafe ever since. (The cafe will remain in business at least through the end of the year.) The notion of this bookstore ceasing to exist remains inexplicable and unacceptable — it would leave a huge hole in local geek culture, and leave science-fiction book lovers without a place to congregate. With so few great science fiction bookstores remaining in the world, the loss of this one is especially hard to stomach. Established authors will find other places to read their work — but newer authors, on tour for the first time, will be especially hard hit. Throughout the years we've managed to plan for the problems that we could predict and, when we couldn't plan for them, we've just worked our asses off to get through. Overall, Borderlands has managed to defeat every problem that has come our way. At the beginning of 2014, the future of the business looked, if not rosy, at least stable and very positive. We were not in debt, sales were meeting expenses and even allowing a small profit, and, perhaps most importantly, the staff and procedures at both the bookstore and the cafe were well established and working smoothly. So it fills us with sorrow and horror to say that we will be closing very soon. In November, San Francisco voters overwhelmingly passed a measure that will increase the minimum wage within the city to $15 per hour by 2018. Although all of us at Borderlands support the concept of a living wage in principal and we believe that it's possible that the new law will be good for San Francisco — Borderlands Books as it exists is not a financially viable business if subject to that minimum wage. Consequently we will be closing our doors no later than March 31st. Many businesses can make adjustments to allow for increased wages. The cafe side of Borderlands, for example, should have no difficulty at all. Viability is simply a matter of increasing prices. And, since all the other cafes in the city will be under the same pressure, all the prices will float upwards. But books are a special case because the price is set by the publisher and printed on the book. Furthermore, for years part of the challenge for brick-and-mortar bookstores is that companies like Amazon.com have made it difficult to get people to pay retail prices. So it is inconceivable to adjust our prices upwards to cover increased wages. The change in minimum wage will mean our payroll will increase roughly 39%. That increase will in turn bring up our total operating expenses by 18%. To make up for that expense, we would need to increase our sales by a minimum of 20%. We do not believe that is a realistic possibility for a bookstore in San Francisco at this time. I'm still hopeful that we can find a solution somehow — they're having a meeting on Feb. 12 at 7 PM, and I would strongly encourage anybody who cares about science fiction books in the Bay Area to be there. The idea of losing this store is simply unthinkable.